Valve today updated its Hardware & Software Survey for December 2013, and the news is once again very good for Microsoft. 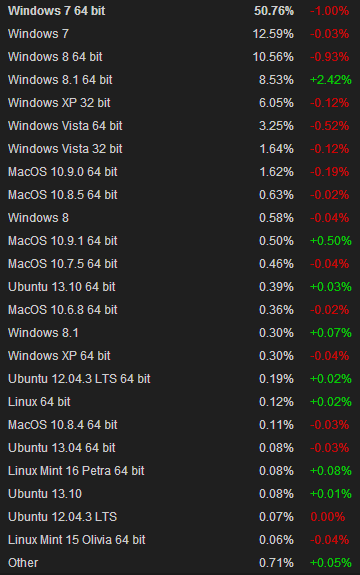 Apple and Canonical have less reason to celebrate Steam usage for their respective platforms, but Windows 8.1 is doing great, having now overtaken Windows XP. It’s worth noting that it took Windows 8 much longer to hit the same milestone Windows 8.1 did today. It passed Windows XP in March 2013, six months after release. While this isn’t an apples-to-apples comparison, it’s still great to see Windows 8.1 pass XP just two months after release. In fact, Windows 8.1 was the only Windows version to gain share between November and December. Gamers are by and large moving to Windows 8.1, though Windows 7 will of course continue to lead the way for at least the rest of the year. Over the last month, Windows 8.1 gained 2.34 percentage points (from 6.34 percent to 8.83) while Windows 8 slipped 0.97 points (from 12.11 percent to 11.14 percent). Windows 7 dropped 1.03 points (from 64.38 percent to 63.35 percent), Windows Vista slipped 0.64 points (from 5.53 percent to 4.89 percent), and Windows XP dipped 0.16 points (from 6.51 percent to 6.35 percent). Microsoft aside, OS X managed to gain 0.20 percentage points to 3.68 percent. Linux, which includes Ubuntu, grew 0.09 points to 1.07 percent. Last month, we predicted Windows 8.1 would pass Windows XP this month, and said it would pass Windows 8 “a few months later.” Now that the difference is only 3 percentage points, we’re betting it will happen as soon as January or February. Read next: "To make an end is to make a beginning"